« Zero Inbox. Zero Spam. Email Nirvana. iTunes Wi-Fi Store. Music search, preview, purchase, and download at the touch of a button. Amazing. And dangerous. This entry was written by Brian McNitt, posted on at 11:56 am, filed under Music. Bookmark the permalink. Follow any comments here with the RSS feed for this post. Post a comment or leave a trackback: Trackback URL. I live in China, and bought a new iPhone two days ago. Having been traveling the last weeks and being rushed as I was leaving Hong Kong I purchased a new iPhone that has been modified to allow it to use other SIM cards. It was good for the first day, until I tried to synch it with iTunes and made the error of updating the software. I can confirm it “Bricks.” The phone is now locked, possibly as if it were a new phone waiting for AT&T’s help to activate it. This is an age where companies are getting larger and larger, and MS was just punished in Europe for anti-trust, and Apple may not be far behind. My question is, “What does Apple and Steve Jobs have to gain?” I have been using Apple computers for about 7 years, and am currently switching my whole office to Mac. I was going to buy a Nokia N (whatever) because I need something that can synch with my office. What could the possible advantage be for Apple to lock people to one Network? A friend of mine is an engineer and Mac Guru. He lives in Switzerland. He will not by an iPhone unless it happens to be on his service provider. If Apple picks a different provider, aren’t they just freezing themselves out? They could have sold millions more than they have if thye had just released the dammed phone and let people put their SIM cards from where they wished. Leave it to the market forces, consumers are fickle and times are a changing. I hope iPhones do not become a symbol of ignorance, an Orwellian example of following the masses, giving into the system and being controlled. I am sure many readers and AT&T clients will jeer at my situation, which is fine. Personally the money i snot the issue. The fact that by the time Apple picks “partners around the world to run their iPhones they will have lost millions of sales, and more phone specific dedicated companies like Nokia et al. will see the differences, see what works or does not, and improve on it. I am sure people will rehack the iPhone soon. I met a guy 7 weeks ago that had bought one of the first hacked ones in HK. It had super slim SIM that sat on his regular SIM that allowed it to work. He had paid 1400 Euros for the honor of having the first iPhone in HK. Again with a question, If so many people are dedicated to trying to get these phones to work with other service providers, why is Apple dead set against it? As somebody that has used Apple’s products for years and championed them to some extent extolling the virtues and superiority, I have also seen that Apple has trouble admitting they were wrong. Take the one button mouse for example. Cute, but, time to move on. We’ll see how this goes, but for now I guess I will buy a Nokia. After all they synch works pretty well, right? Great comment, Kosmo. Thanks! As far as Apple bricking the iPhones, I can see why they do it for non-AT&T carriers. The rumor is that Apple gets a percentage of the monthly AT&T service bill. I assume other carriers are not willing to offer the same, but perhaps (and hopefully) new deals are in the works. As far as the iPhone being an open platform, there is hope on the horizon. 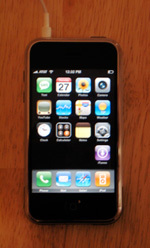 Apple announced several weeks ago that they plan to release a developer SDK by February, 2008. This seems like a good compromise to me as it gives Apple an opportunity to formalize the API and hopefully create a secure application environment. Apple has had such a great track record for security. I think it’s important for everyone involved, as well as the Apple brand, that track record continue. Overall, a great first effort. On the first try, Apple has lifted the bar for mobile devices. Hopefully they will smooth over some of the 1.0 shortcomings moving forward. The scary part is with all the people now dedicated to cracking the iPhone security software, and people getting angry at Apple, wont this create more people able to hack and create Apple viruses? I was always told that Apple users don’t waste their time writing viruses, but if there is any similarity between the iPhone and OSX software, wouldn’t this be a training ground for future Apple hackers?